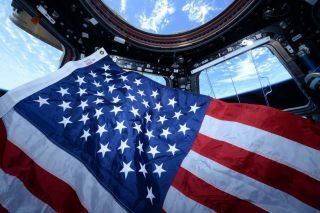 The three astronauts aboard the International Space Station don't have special plans for the Fourth of July, though NASA's Scott Kelly (who took this shot in the station's cupola on Flag Day in June 2015) will try to see some Earthly fireworks displays. Orbiting NASA astronaut Scott Kelly doesn't have any special plans for the Fourth of July, though he will try to catch a glimpse of the fireworks displays down on Earth. "Hopefully the timing will be right, and I'll be able to look down and see little specks of light over the United States on the evening of the Fourth of July," Kelly said Thursday (July 2) during a video interview with NASA spokesman Dan Huot of Johnson Space Center in Houston. "We'll have to see how the orbital mechanics and such works out." So keep an eye on Twitter, where Kelly will post any cool snapshots he gets of the festivities. (He tweets as @StationCDRKelly). "Nothing really special planned," Huot told Space.com. "It's a regular Saturday, and they're going to get the day off. Looking at their timeline, they do have weekly housecleaning tasks scheduled, but that's it." Although astronauts get a special turkey meal on Thanksgiving, the Fourth of July has traditionally not carried any special food or celebration, other than a day off. During the July 2 interview, Huot asked Kelly how it feels to represent the United States aboard the space station this holiday. "It always feels great, and a privilege to represent our country," Kelly replied. "On holidays, you even feel more special; you have more of a patriotic feeling." Kelly, Kornienko and Padalka will soon have company: Three more crewmembers are set to launch toward the orbiting lab on July 22 aboard a Russian Soyuz spacecraft.